On Feb. 22, 2014, Patricia Elder received the Cross of the Order of St. Benedict. Though a dynamo of volunteerism and an engine of community service in the Archdiocese of Kansas City-Kan., Elder is usually overlooked in such awards, since she spends so much time in her primary vocation as homemaker, home-schooling mother and parish volunteer. Here are her moving words of gratitude upon receiving her award. What an honor it is to be a recipient of such a prestigious award. Receiving this honor, the Cross of the Order of St. Benedict, is crossing the line for me — where fantasy becomes reality. I have followed this award since I was a student at Benedictine in the early 1980s (which, I know, sounds almost creepy). But I have told my husband for years — wouldn’t it be wonderful to be the type of person who brings water to a third world country or has the means to donate millions to Benedictine College … thereby being worthy of this award? Well friends, sadly, I have done neither. First, I need to say that if I have done anything well in my lifetime, then all glory be to God. Right? Because we are created in his image and all good comes from him. But I have to admit; it was my time at Benedictine that infused the sense of volunteerism that I have lived the past 30 years. There is nothing like waking to the sound of the Abbey bells, having Mass available a few times a day and the physical presence of the Benedictines on campus to help form a young Catholic. Many kids talk of losing their faith during college. Benedictine College is a place where students can cement their Christian beliefs. Being of service to others was paramount at the college. It was at Benedictine College that I first learned about the Crop Walk which led to an 18-year commitment with the Hunger Project. We were able to break political and economic barriers by getting a regular food source to the Bayad Taluka, a small village in India — and that entrée began the onset of decades of assistance to many villages in India. Sadly we did not meet our ultimate goal — which was to eradicate hunger by the year 2000 — but we made much progress. The “duty to serve” was part of the language I consistently heard on campus in the ’80s. That message has carried me to various ministries in our diocese — Project Rachel being one that I’ve been with for almost 15 years. Please know that thanks to our beloved Archbishop Naumann, our pro-life efforts are stronger than ever and there are many, many resources available to you — should you ever need them. Our services for post abortive healing or free sonograms are here for anyone, any age, any faith — free of charge. Pat Klausner is the compassionate voice of Project Rachel and Donna Kelsey will turn on a dime to offer a sonogram to a woman who is contemplating abortion. In my opinion, President Minnis is a remarkable leader. He took a good college and made it great. I believe that happened because of his devotion to Our Lady and strict adherence to the teachings of our church. So as I tried to understand why I, a simple, plain-jane, homeschooling mom would receive this award — it dawned on me. 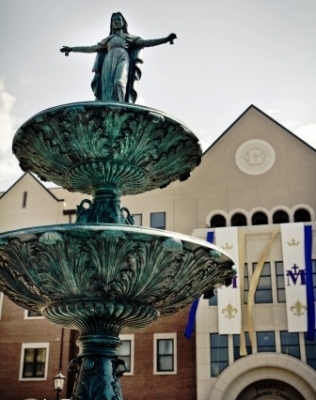 Under President Minnis’ leadership, Mary’s Grotto has been built, the Mother Teresa Center was established and the college consecrated to the Blessed Virgin Mother. At Benedictine College, being a mom is enough. In light of that, I humbly accept this award on behalf of all moms who are educating their children, ensuring vocations are regularly talked about in the home and volunteering in our diocese, schools, hospitals, food kitchens, etc. I share this award with my family, because while I am getting the recognition, they are the ones who are teaching rosary making skills to kids, praying with me in front of Planned Parenthood — in all the elements, doing their Legion of Mary work, understanding when I need to cancel with them to help someone who is post-abortive or help someone with an unplanned pregnancy — who is needing to know about options. God has been so generous to me — I have been blessed with a husband and children who support a life of service as well. With sincerest and deepest gratitude, I thank you.